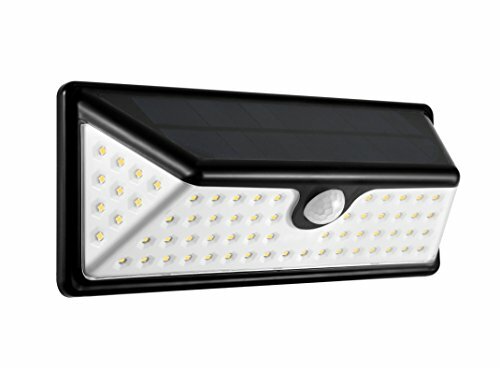 ASIGN Solar Powered Lights will automatically light on at night and light off at day. 73 leds spread over 3 sides (down, left and right) offer wider angle beam and a larger coverage of luminosity (500 LM). Moreover, the 4400mAh Lithium Battery offers long lighting time. it can detect motion up to 10-26 feet away at a 120 degree angle. 3 lighting modes can be chosen according to different needs. A Waterproof Security Lights for Garden, Yard, Wall and Park. 2. Please put the unit under the sun for serveral hours before the first-time use. 3. It can detect motion up to 10-26 feet away at a 120 degree angle. Installing height 5.6 feet - 6.6 feet will be better. 4. Nomally, this solar lights can light on for 6-8 hours when it is charged 8-10 hours. For absorbing enough power to work, please make sure this unit is put in direct sunlight all day. 5. When the unit is flickering, it means out of power. Products were ertified by RoHS, CE, FCC and IP65. 2 years warranty. If there are any problems, pls feel free to contact us. Solar Sensor Outdoor Lights: ASIGN Solar Powered Lights will automatically turn on at night, charging in the sun. PIR (passive infra-red) motion detector is used to sense movement of people, animals, or other objects. It can be used in automatically-activated lighting systems.